The T-34 tank rumbled out of the Russian plains to become the most formidable tank of WWII and Korea. Early in World War II, German panzer forces trampled all foes. Confidence suffused the Germans, and their tank designs stagnated. Then in 1941 out from the Russian steppes roared a tank that would shake Wehrmacht confidence to the bone. It was the T-34, and it outclassed the panzers in almost every respect, sending the Germans scrambling back to their drawing boards. Nine years later this same tank awakened another military giant from a similar state of lethargy. The United States, certain that no one would challenge it lest they be incinerated with atomic weapons, received a fearsome wake-up call in Korea. The North Korean Peoples Army led by the T-34 steamrolled U.S. forces and their South Korean benefactors. The T-34 tank was without a doubt one of the best tanks of its time and remains in service in approximately 30 countries to this day. This formidable weapon began life as a fast tank design in 1936. Red Army fast tanks or “BTs” of the period had a torsion bar suspension based on the design of American J. Walter Christie. The suspension was able to run on tracks or, for greater speed, large road wheels. Then M.I. Koshkin, the T-34’s designer, reasoned that crews rarely used the road wheels and pushed for a totally tracked tank. With the addition of heavier armor and a larger gun, the T-34 was born as a medium tank in 1939. Limited production began in January 1940, and full-scale production in June. When the Germans invaded in June 1941 about a thousand were available for combat. The new tank featured welded construction and was easy to manufacture even with unskilled labor. It proved just as easy to maintain, always an advantage on the battlefield. Although construction was simplistic, the design introduced some groundbreaking features. Armor thickness varied between 14 and 45mm, but was well sloped (as much as 60 degrees) to increase its effectiveness. Wide tracks reduced its ground pressure to only 11.2 lbs/sq in., greatly enhancing its cross-country mobility. T-34s were powered by the world’s first diesel engine purposely built for tanks. The 500hp V-12 water-cooled engine was less of a fire hazard than contemporary gas motors, and propelled the 26.3-ton vehicle at 31 mph, with a range of 186 miles. The crew of four consisted of a commander and loader in the turret and a driver and machine gunner in the hull. The turret could be either mechanically or hand traversed. These early T-34s had one 76.2mm gun and two 7.62mm machine guns. The main gun was dual purpose, able to fire both high-explosive (HE) and armor-piercing (AP) rounds. Another advantage in combat was the vehicle’s relatively low silhouette. In the early morning hours of June 22, 1941 a massive artillery barrage announced the start of one of the most savage military struggles in human history: Germany’s war with Russia. Although a fair number of T-34s were already in service, the Russians’ practice of spreading their armor through their infantry divisions deadened their impact. Many were swept up, like so much other Russian equipment, in the German tidal wave and captured along with hundreds of thousands of men in massive encirclements. This was blitzkrieg on a grand scale. The impact of the new tank caused a shock wave that spread from the panzer crews all the way back to Hitler. Initially cries rang out to build an outright copy of the Russian tank, but national pride and practicality precluded this. Design of an all-new medium tank that eventually would become the Panther was ordered. Another design for a heavy tank that had been simmering on the back burner since 1937 was also pushed forward; it would be known to the world as the Tiger. These efforts would field some of the most outstanding tanks of the war, but it would be at least a year before they were available. In the meantime, efforts were made to increase armor and armament on the Panzer III and IV. Other stopgap measures included mounting captured Russian antitank guns on the chassis of obsolete tanks after removing their turrets. An armored fighting compartment was built around the guns to protect the crews. These panzerjäger, or tank hunters, served to bolster the beleaguered panzer crews. Russian designers did not rest on their laurels and efforts were constantly made to improve the T-34. In all, five more models of the T-34/76 were produced after the initial A model. The B model added a longer 76.2mm L/40 gun and a rolled-plate turret. Later the turret was cast, not rolled, and with steel road wheels added at the end of the production run, its weight increased to 28 tons. With the C model a larger turret with two hatches was incorporated along with track and vision port improvements. A new hexagonal shaped turret, wide gun mantlet, and jettisonable fuel tanks marked the D model. Armor was increased to 70mm in some areas, pushing weight to 30.9 tons. Improvements on the E model included better engine cooling and the addition of a commander’s cupola. F added a five-speed transmission, but only a hundred were built before production switched to the new T-34/85. As was typical for the period, several variants based on the T-34’s chassis were also developed; these included command tanks, bridge layers, “tank-dozers,” flamethrowers, and land-mine roller versions. In 1944 the Russians brought out the T-34/85 to counter the superior Tiger and Panther tanks. An 85mm gun replaced the 76.2mm. A modified KV-85 three-man turret was added, allowing the commander to command instead of aiming the gun. Armor was 18 to 75mm thick and the weight now was 31.5 tons. The same 500hp engine was used. Handrails were welded around the turret to aid the transport of infantry. This was the definitive T-34, and it remained in production long after the war ended. The T-34 was not without weaknesses. In early models the two-man turret threw too much work on the commander. This problem was compounded by the fact that there were no radios in vehicles below the platoon-commander level, a fault that greatly restricted the tactical flexibility of small units. Another problem was the inability of the main gun to be depressed more than three degrees below the center line, causing difficulties fighting from the hull-down position as well as at close range. These few drawbacks aside, the T-34 was the most important Russian tank of the war and certainly helped save Russia from defeat by the Wehrmacht. By war’s end over 40,000 had been produced, 12,000 of which were T-34/85s. Although tank for tank the Panther and Tiger may have been better, the simple fact remains that for every one of these German tanks produced, seven T-34s rolled out to meet them. When World War II ended the U.S. Army began a massive reduction. Indeed, many professionals believed that ground forces were obsolete now that the United States had a nuclear arsenal. At the same time, the Cold War began and the world was becoming polarized between the West and Communist countries. In Korea the 38th parallel divided a Russian-backed government in the north and a U.S.-sponsored one in the south. America declined to give the South Koreans heavy weapons for fear they might try to invade the north. Russia had no such reservations. The North Korean People’s Army, or NKPA, was over 100,000 strong and well equipped with Soviet arms. Among their arsenal were about 240 T-34/85 tanks as well as SU-76 assault guns. The North Korean tanks were split among three armored brigades—the 105th Brigade had 140, the 26th had 40, and the 17th 45. Most of these were massed along a 40-mile front north of Seoul. On Sunday morning June 25, 1950 NKPA artillery erupted all along the 38th parallel and armored spearheads began thrusting into South Korea. The South Koreans and their American advisers had no tanks or recoilless rifles, and only light artillery. The few 37mm antitank guns and 2.36-in. bazookas available bounced off the thick skin of the T-34s. Other than a few suicide attacks with high explosives, southern forces were powerless to resist the charging steel monsters. North Korean tankers took advantage of their prowess. Advancing boldly, they would penetrate infantry formations, overrunning command posts and artillery positions in the rear. These tactics served to tear apart successive lines of resistance. To buy time, General Douglas MacArthur, commanding the U.S. forces, desperately scraped together formations from occupation troops in Japan and sent them into the cauldron. The first concentrated American effort to engage the NKPA was Task Force Smith under Lt. Col. Charles Smith. The force comprised two infantry companies and a battery of 105mm howitzers. They were positioned on the Seoul-Pusan road to slow down the North Korean drive on the vital port city of Pusan. Smith chose a hill near Osan to make his stand. He positioned his two 75mm recoilless rifles on either side of the road and sprinkled the few available bazookas among the infantry. One of the 105mm guns was brought up to help against tanks, while the other four were 2,000 yards behind. Over 30 T-34s charged the tiny task force through a drizzling rain. Smith’s men met them with recoilless rifle and bazooka fire. To their horror they had no effect. The Americans were pounded with cannon and raked with machine guns as the tanks advanced. Using HEAT (high explosive, antitank) rounds, the 105mm managed to knock out two T-34s. The rest of the armored juggernaut simply plowed through, heading for the artillery in the rear. The stunned GIs were then struck in the flanks and center by North Korean infantry. Overrun, the survivors were forced to retreat in small groups. The T-34’s first tank adversary would prove to be the M24 Chaffee, a light reconnaissance tank. With only 25mm of armor and a low-velocity 75mm gun incapable of penetrating the T-34’s frontal armor, its crews prudently tried to avoid combat with the North Korean tank. Still, several of the approximately 50 that arrived in early July were destroyed in tank duels. 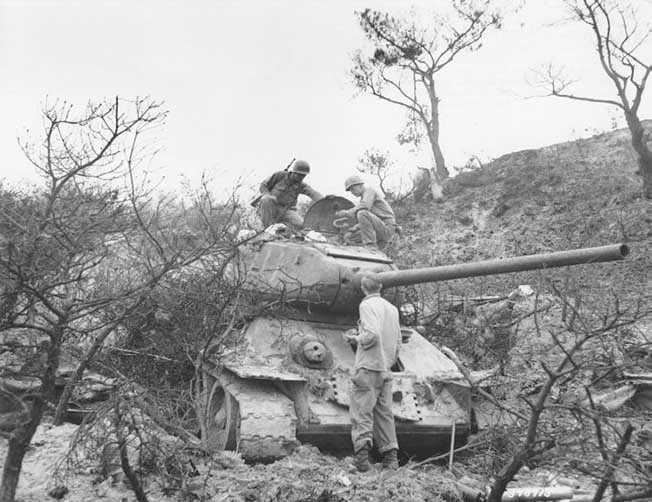 While the Chaffees and three worn-out M26 Pershing tanks found in Japan held the line, the U.S. Army scrounged for tanks. They even took M26s that were placed around Fort Knox as monuments. Soon tanks were pouring into Pusan and by the third week in August there were over 500 American tanks in Korea. These were M4A3 Shermans, the most advanced Sherman of World War II; M26s; and M46 Pattons, which were improved M26s. All were formidable opponents for the T-34. The North Korean tankers were about to enter a new phase of the war. The newly arrived U.S. medium tanks, along with larger 3.5-in. bazookas, and a preponderance of UN airpower forced a change in the T-34 crews’ tactics. They moved at night, attacking mainly at first light with infantry support. When caught in the open they suffered under napalm attacks or a barrage of bazooka, recoilless rifle, or tank fire. 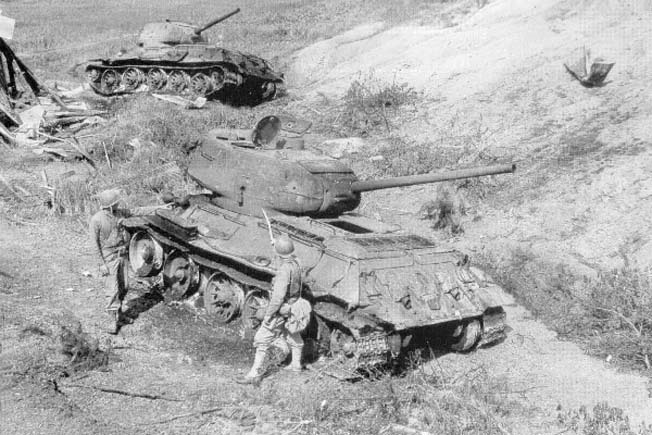 When the UN forces started their own offensive and pushed north they found 239 destroyed or abandoned T-34s scattered from the Pusan Perimeter to the Yalu River. After the Chinese surprise attack again changed the flow of the war, North Korea reformed its armored forces. They were held in reserve near Pyongyang where they were joined by Chinese armored and mechanized units. Totaling around 400 tanks, they were subject to UN air attacks and never again committed to battle. Despite the fact that both sides fielded a good number of tanks during the war, there were no large armored clashes. The terrain was mountainous and rough, with rice paddies in the low lands, thus confining movement mainly to roads. Consequently, battles usually involved platoons of tanks at most. The largest tank versus tank clash took place on November 1, 18 miles south of the Yalu River. Eight T-34s and an SU-76 engaged about a dozen M46 Pattons. The North Koreans were wiped out in a half-hour firefight. This was the last time tanks met in battle during the war. Although the role of the T-34 in the conflict was short-lived, it cannot be denied that it was largely responsible for the North Koreans’ early success. The T-34 was phased out of Russian service in the mid-1950s, but limited production of an updated version with a new engine and wheels continued until 1964. Eventually, 50,000 were built, with much of the manufacturing taking place in Czechoslovakia and Poland. The vehicle was widely exported around the world and remains in service with nations throughout Africa, the Far and Middle East, and Southeast Asia. Since the Korean War, the T-34 has seen combat in the 1956, 1967, and 1973 Arab-Israeli wars, as well as the 1982 Israeli invasion of Lebanon, plus actions in Angola and Yugoslavia. When introduced, the T-34 was truly revolutionary, and the longevity of its combat career attests to its prowess. It set the trend for a long line of excellent Russian tank designs. The impact it had on its adversaries in World War II and Korea shows the price to be paid for over- confidence and complacency. Tags antitank gun, Blitzkrieg, Charles Smith, general heinz guderian, Panzer, Panzer V Panther, Pyongyang, Red Army, T-34 tank, Tanks, wehrmacht, Yugoslavia.